The main number we should concentrate on, and one we’ve been watching for most of the beginning of 2019 is the rising “median days on market” for both condos and single-family homes. Condos are up from 16 to 22 days, year over year, and houses are up from 14 to 24 days, year over year, meaning properties across the board are sitting longer on the market before going into Escrow. 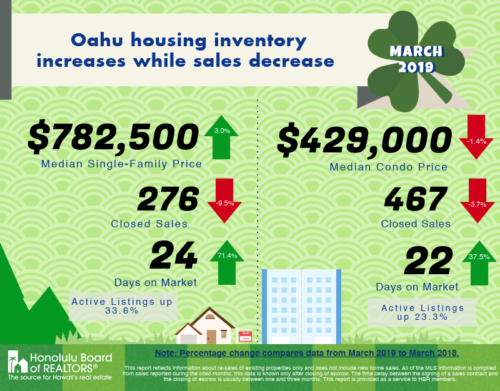 This is mostly due to the fact that there is a lot more inventory coming into the market this year, giving Buyers a lot more options to purchase. This has been the theme for 2019 so far, and something that we’ve seen coming since the end of last year. Between the government shutdown, fear of rising interest rates, the trade war with China, and other political factors, it seemed like Buyers were a little more hesitant to make major changes as the new year began. It was actually a good thing in my opinion because it gave the tight inventory market a little time to catch up with demand. Now that interest rates are back down, it’s time for Buyers to take advantage of the better inventory and get exactly what they want.